Idris Elba voices Shere Khan in the 2016 live-action film The Jungle Book. In this incarnation, Shere Khan has several noticeable scars (sustained from fights with humans) including a blinded left eye. He also hates humans and views them all as a threat, much as his previous Disney incarnation does. When interviewed regarding the character, Elba described Shere Khan as a creature "that reigns with fear" and that he "terrorizes everyone he encounters because he comes from a place of fear." Shere Khan first appears during the drought, when the animals gather to drink at Peace Rock, a watering hole where the animals maintain a water truce not to devour each other while quenching their thirst. Upon scenting Mowgli, he threatens to kill him as man is not allowed to live in the jungle. This causes Akela and his wolf pack to debate whether to have Mowgli leave. When Mowgli leaves the wolf pack with Bagheera, Shere Khan ambushes him en route and fights with Bagheera. Though Shere Khan defeats and mildly injures Bagheera, Mowgli escapes with the aid of a herd of buffalo. During Kaa's attempt to hypnotise Mowgli, she reveals that Shere Khan himself is responsible for Mowgli being found by Bagheera, as he fought and killed Mowgli's father (an event that left him with his facial scars and passionate hatred for humans). He later returns to confront Akela's pack and demand Mowgli is turned over to him, killing Akela by grabbing him in his jaws and throwing the wolf leader off a cliff when he learns that Mowgli is on his way to the Man-village. He then assumes control of the wolves, confident that Mowgli will return. When Mowgli hears of Akela's death, he returns to face Shere Khan with a burning torch stolen from the Man-village; Shere Khan points out that he has accidentally started a wildfire in the process, and that the animals now have more reason to fear Mowgli than Shere Khan. When Mowgli throws away the torch, Shere Khan attacks Mowgli, but the combined efforts of Baloo, Bagheera and the wolf pack keep him distracted long enough for Mowgli to set a trap in the burning jungle nearby. During their battle, Mowgli lures Shere Khan onto a dead strangler fig tree and eventually defeats him by causing him to fall into a pit of fire to his death, ending his tyranny once and for all. In Disney's 1967 animated adaptation of The Jungle Book, Shere Khan's voice was performed by George Sanders, while his singing voice was provided by Bill Lee. He was designed and animated by animator Milt Kahl. The inhabitants of the jungle fear him greatly; mere news of his being in the vicinity compels the wolf pack to send Mowgli away. Man's gun and man's fire are the only things Shere Khan fears, and consequently, he feels the urge to kill humans whenever the opportunity presents itself. Shere Khan first appears about two-thirds of the way through the film where, after having been interrupted during a hunt by Colonel Hathi, he eavesdrops on Bagheera asking the elephants to help search for a now-lost Mowgli and sets out to find and kill the boy. He later encounters Kaa just as he was going to eat Mowgli, but the snake denies any knowledge of the man-cub. Doubting Kaa's honesty, Shere Khan threatens Kaa into showing his middle by loosening his coils, inadvertently allowing Mowgli to escape after the tiger resumes his search. In the climax, Shere Khan finds Mowgli, who refuses to run and instead stands up against Shere Khan, saying that he is not afraid. Impressed by Mowgli's bravery, Shere Khan, for his own amusement, gives him a ten-second head start to run away, but Mowgli still refuses and grabs a stick, intent on fighting the tiger. Shere Khan becomes annoyed and immediately attempts to attack Mowgli, who flinches in fear, finally understanding the true danger of the ferocious beast. Fortunately, Baloo arrives just in time and grabs Shere Khan by the tail. Mowgli then hits Shere Khan with his stick. 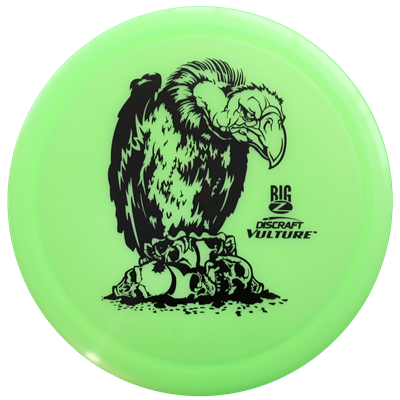 Enraged, he chases Mowgli while dragging Baloo behind him, but the vultures manage to fly Mowgli to safety. Baloo proves such a strong opponent to Shere Khan that he decides to savage the bear, nearly killing him. Upon learning that Shere Khan is scared of fire, Mowgli grabs a burning branch from a lightning-struck tree, and the vultures distract Shere Khan long enough for Mowgli to tie the branch to his tail. Shere Khan panics and flees. 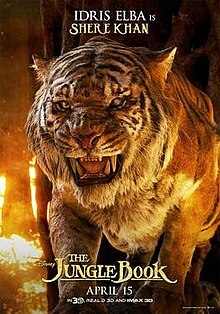 Shere Khan returned (and had more on-screen time) in The Jungle Book 2. Humiliated by the ordeal of his tail being tied to a burning branch in the original film, the tiger has sworn to kill Mowgli for revenge. He first searches the Man Village and is chased off by the villagers. He then searches the jungle for Mowgli and is lied to by Kaa, who tells him that Mowgli is at the swamp out of fear, and being pestered by Lucky, a new but dim-witted member of the vultures, who accidentally reveals Mowgli's whereabouts before Shere Khan violently attacks him for his jokes, causing the other four vultures to fly away in fear. Shere Khan and Mowgli ultimately meet again as Mowgli tries to reconcile with Shanti and Ranjan, who, unbeknownst to him, were cornered by the tiger at that very moment. Barely escaping, Mowgli hides in an abandoned temple surrounded by lava. Shanti, Ranjan, Baloo, and Bagheera hurry to save Mowgli. After Baloo and Shanti team up, they, along with Mowgli, confuse Shere Khan by banging three different gongs. Eventually, Shanti's gong collapses, giving away her hiding place. 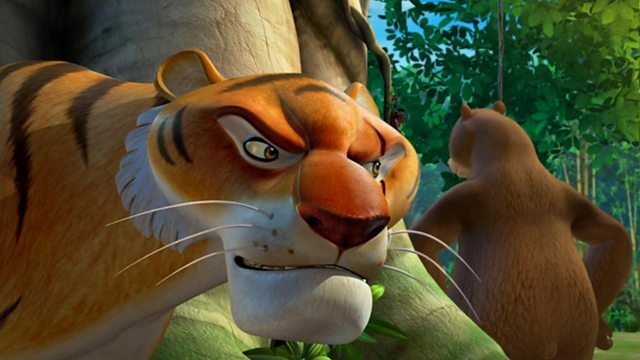 Shere Khan threatens to kill Shanti instead unless Mowgli comes out of hiding, forcing Mowgli to reveal himself. Shere Khan then chases the two of them, despite Baloo's efforts to slow him down. Mowgli and Shanti jump over a pit of molten lava and grab onto the head of a tiger statue. Shere Khan leaps across and corners the children. Before he can kill them, his weight causes the statue to fall with the three of them on it. Shanti and Mowgli are saved by Baloo while Shere Khan falls onto a stone slab in the lava pit, and the statue lands on top of him, trapping him inside its mouth. He is last seen being taunted by Lucky. In The Jungle Book 2, Shere Khan was voiced by Tony Jay, who reprised his role from the Disney Afternoon series TaleSpin.